Experience the inspirational and true story of an unlikely cycling champion who battled the odds to reach the pinnacle of his sport in The Flying Scotsman, now available on DVD from MGM Home Entertainment. Jonny Lee Miller (Trainspotting, Melinda and Melinda) stars as Obree, an amateur cyclist and homegrown hero who became Scotland's two-time world one-hour cycling record holder while also struggling and learning to cope with debilitating bouts of depression and anxiety. A true testament to the human spirit, the film spans the period of Obree's life that saw him take, lose, and then retake the cycling title as he races to victory on a bicycle he built himself from scraps of metal and washing machine parts. Featuring a remarkable supporting cast including Laura Fraser (Vanilla Sky, A Knights Tale), Billy Boyd (The Lord Of The Rings Trilogy, Master and Commander), and Brian Cox (Zodiac, Running With Scissors), The Flying Scotsman is a triumphant tale about a defiant outsider whose perseverance, undying commitment and ambition allowed him to ride victorious against well-financed, professionally trained competitors on the international cycling scene. The Flying Scotsman is presented on a flipper disc in both full screen and widescreen format for the suggested retail price of $27.98 U.S./$43.48 Canada. It is available at most major retailers and on line at theflyingscotsmandvd.com. You can check out a film clip here. 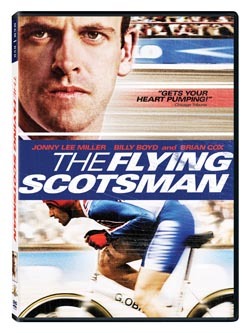 The Flying Scotsman is a true story based on the inspirational and remarkable Scottish cyclist, Graeme Obree. In 1993, this unemployed amateur broke the world one-hour record on a bike of his own revolutionary design, which he constructed out of scrap metal and parts of a washing machine. Shortly after Graeme broke the record, he lost his title when another cyclist beat his time. This only served to motivate Graeme to break the record again, while also battling mental illness. The Flying Scotsman DVD is available in both widescreen and full screen versions on a DVD-10 flipper disc and features English 5.1 Dolby Surround Sound, as well as French and Spanish 2.0 Dolby Surround and English and Spanish subtitles. Metro-Goldwyn-Mayer Inc., through its operating subsidiaries is actively engaged in the worldwide production and distribution of motion pictures, television programming, home video, interactive media, music and licensed merchandise. The company owns the world's largest library of modern films, comprising around 4,000 titles. Operating units include Metro-Goldwyn-Mayer Studios Inc., Metro-Goldwyn-Mayer Pictures Inc., United Artists Films Inc., MGM Television Entertainment Inc., MGM Networks Inc., MGM Distribution Co., MGM International Television Distribution Inc., Metro-Goldwyn-Mayer Home Entertainment LLC, MGM ON STAGE, MGM Music, MGM Worldwide Digital Media, MGM Consumer Products and MGM Interactive. In addition, MGM has ownership interests in international TV channels reaching nearly 110 countries. MGM ownership is as follows: Providence Equity Partners (29%), TPG (21%), Sony Corporation of America (20%), Comcast (20%), DLJ Merchant Banking Partners (7%) and Quadrangle Group (3%). For more information, visit www.mgm.com. A recognized global industry leader, Twentieth Century Fox Home Entertainment LLC (TCFHE) is the worldwide marketing, sales and Distribution company for all Fox film and television programming on VHS, DVD and Blu-ray Disc (BD) as well as acquisitions and original productions. The company also releases all products around the globe for MGM Home Entertainment. Each year TCFHE introduces hundreds of new and newly enhanced products, which it services to retail outlets -- from mass merchants and warehouse clubs to specialty stores and e-commerce - throughout the world. Twentieth Century Fox Home Entertainment LLC is a subsidiary of Twentieth Century Fox Film Corporation, a News Corporation company.